Applications: For use with mandrels. Suitable for most metals. 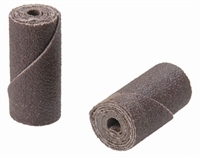 Straight cartridge rolls offer a convenient means of sanding parallel sided holes. Available from grade 60 to shape and de-burr and finer grades to clean and finish. Product Notes: Uses a high grade of aluminium oxide abrasive, suitable for most steels. As it wears it exposes fresh abrasive. Material is spiral cut to provide an even application. Also Available: Mandrels - choose S18 for 3mm or S19 for 6mm spindle.